Fox Deportes HD is a sports channel broadcasting Spanish content 24/7 in the U.S. The channel was formerly known as Fox Sports en Español, but it acquired its current name in 2010. This channel is owned by the Fox Entertainment Group and is available on most major payTV systems. 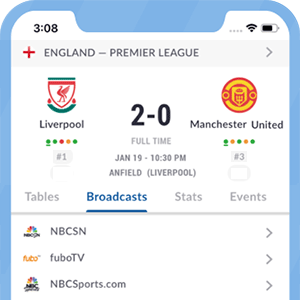 Over 22 million homes enjoy Fox Deportes' programming in the U.S., which is centered in satisfying the demand of the Spanish-speaking community in that country. Fox Deportes owns broadcasting rights to some of the major football competitions in the world. Spanish-speaking fans in the U.S. might enjoy games from continental competitions such as the Copa Libertadores, the UEFA Champions League, International games for National teams and domestic leagues such as the German Bundesliga. Fox Deportes' football coverage is boosted by their involvement in other disciplines, which include baseball, college sports,NFL football, UFC and motor sports, among others. Where channel is Fox Deportes on? Fox Deportes HD is also available on most cable TV suppliers in the U.S. Check your local listings for availability. *Got itLive Soccer TV does not provide FOX Deportes live streaming. The information provided on this page is simply FOX Deportes soccer TV schedule.